RA now includes Inner Circle? This morning I received an email that my IHG account had been updated. Given that site security is.... crap, I logged into my account to make sure everything was still OK. When I logged in, I noticed that I was now an "Inner Circle Member" and there was account activity related to this. Is this expected, and do we know if Kimpton spend counts towards RA status now? This is a bit weird since I've _never_stayed at a Kimpton property. I got the same -- although on Jan 4th. Apparently some other RAs did as well. 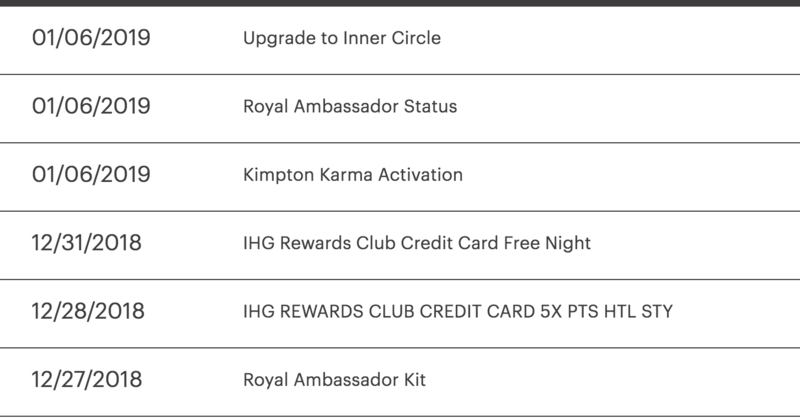 In your case it looks like you were not a Kimpton Karma member (or never linked to your IHG Rewards). I was a member and stayed just 3 nights last year; mine showed "Upgrade to Inner Circle"
Does anybody that was inner circle last year still have a digital card saying 12/31/2018? Am I doomed to reset to a basic member? Or could I possibly get a soft landing? My digital card says “EXP 2019” with no specific date. I think if you can still edit and see your inner circle preferences in your profile, you should be Inner Circle for 2019.